Toddlers are picky eaters. They simply refuse to eat anything that they don’t like, no matter however much you goad them. So, preparing a meal for them, especially one as important as lunch, can be a challenge. A toddler’s lunch should be nutritious as well as delicious. 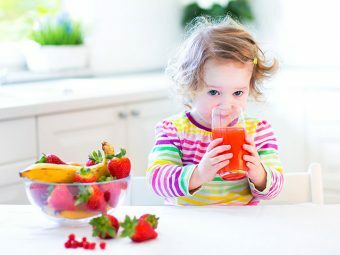 Here, MomJunction gives you 21 such healthy toddler lunch recipes that your little one will love. This is a quick and tasty toddler lunch idea that is packed with protein and fiber. Boil the chicken for 20-25 minutes, or until it becomes tender. Let it cool. Transfer the chicken, along with the broth, to a blender. Add salt and blend it into a puree. Heat oil in a frying pan, break the egg and scramble it. Toast the bread and then cut it into smaller triangles or squares. Combine the chicken puree, scrambled eggs, add a pinch of black pepper, and pack it between the toasted bread pieces to make a sandwich. A meal rich in micronutrients, the mashed beetroot rice is ideal for babies sill learning to chew. Boil the rice and the beetroots separately, on a medium flame for 20-25 minutes, until they are tender. You can also pressure cook the rice and beetroots together. Cook for seven to ten minutes on medium flame. Transfer the cooked rice and boiled vegetable on to a plate. Add salt and mash them using a masher or a fork. Lentils and green peas can be combined to make a healthy protein lunch for a toddler. Boil the lentils for 20-25 minutes on medium flame, or until they are soft and entirely cooked. For faster results, pressure cook the lentils. Bring the cooker to full pressure and after one whistle, cook on medium flame for six minutes. Boil the green peas separately for 15 minutes. Blend the lentils and green peas into a thick puree. Add salt to taste and serve. This can be a toddler’s midday meal, filled with carbohydrates and protein. Steam the potatoes on a medium flame for 20 minutes or until tender. Boil the boneless chicken and onions for 15 minutes. Strain the chicken out and blend the onions with the chicken stock to make a thick paste. Heat cooking oil in a frying pan. Pour the onion paste and put the chicken pieces on top. Fry them for 10-15 minutes on a low flame, while stirring to mix them properly. Transfer the cooked chicken to a bowl, add cooked potato pieces, and stir them together to complete the preparation process. This is a preschool lunch idea rich in iron and several essential micronutrients. Boil the spinach for seven minutes, or until tender. Strain the spinach and run it under cool water. Boil the pumpkin and the garlic for ten minutes on medium flame. Combine the pumpkin, garlic cloves, spinach, and salt in a blender until you get a thick puree. The delicious soya meal is an ideal vegan lunch idea for a toddler. It is also an excellent snack idea for preschoolers. Boil the soya nuggets in water for five minutes, strain them out and wash them once with cool water. Leave them in cold water for two minutes. Squeeze the nuggets and set them aside. Boil green bell pepper for 10-15 minutes on medium flame or until they are entirely tender. Heat vegetable oil in the cooking pan. Add soya nuggets, green pepper, and garlic paste. Cook them together till thoroughly done. Finger millet (Ragi) is abundant in micronutrients that are vital for the healthy development of the toddler. When you combine them with sweet potato, you make a delicious lunch dish for the toddler. Boil the sweet potatoes for 10-15 minutes, or until tender. You can also pressure cook the potatoes for eight minutes. Pour water and millet flour in a cooking pot. Cook it on a medium flame for about ten minutes while stirring continuously to prevent the formation of lumps. Add the cooked sweet potatoes to the cooking flour, simmer the flame and cook for a couple of minutes. Let the porridge cool before serving it to the toddler. Rice and chicken porridge with a dash of ginger-garlic paste is a healthy meal idea for a toddler. Cook the boneless chicken for 20-25 minutes on medium flame. Cook the rice flour by boiling it for 10 minutes on a medium flame, while stirring it to prevent the formation of lumps. Add the cooked chicken pieces, ginger-garlic paste, to the cooking rice flour and simmer cook for 3-5 minutes. Let it cool and serve it to the toddler. A tasty lunch idea for a picky toddler. Cheese, vegetables, and wheat make an excellent combination here. Whisk the water and oil in a large bowl. Then add whole wheat flour, all-purpose flour, cheese, and salt to it. Mix them to form a dough. Cover the bowl with cling-film and leave it in a warm, dry place for 30 minutes, to make it a bit fluffy. In a blender, add the vegetables and the ginger-garlic paste. Add a bit of water and blend them all into a coarse mix. Roll the dough into a large flat tortilla. Spread the blended vegetables on the dough and then roll the dough to make one large roll. Cut it into smaller roll sections of the desired size. Preheat the oven to 400 °F (204 °C). Grease a baking tray with some oil and place the rolls on it. Bake the rolls for 15-20 minutes or until they turn golden brown. Cool and serve. The dry nature of the preparation also makes it a delicious packed lunch idea for toddlers. The patty makes for a crunchy school lunch for toddlers. Boil the vegetables for 20-25 minutes or until they are tender. Strain the vegetables and transfer to a bowl. Add ginger-garlic paste, whole wheat breadcrumbs, half a tablespoon vegetable oil, and salt. Add vegetable stock and combine them well to make a thick mix. Make small patties with the batter. Heat half a tablespoon of oil and shallow fry the patty on a medium flame. Cook both sides until they turn light brown. Let it cool before serving. A power-packed lunch with the iron-rich spinach and a protein-packed chicken. Boil the chicken for 20 minutes on medium flame, or until tender. Cook the spinach for seven to eight minutes on medium flame. Once cooked, strain the spinach and discard the water. Cook rice for 10-15 minutes or until it turns soft and tender. Add the cooked spinach, chicken, black pepper, and salt. Simmer cook for 10 minutes while stirring to mix the ingredients well. If the mix gets too thick, then add chicken stock. Cool before serving to the toddler. An easy toddler lunch idea that you can prepare with avocado, sweet potato, and some whole wheat bread. Cut the avocado and sweet potato into long slices. Preheat the oven to 425 ºF (218 ºC). Grease a baking tray with some vegetable oil, place the sliced avocado and sweet potato. Bake for 20 minutes. Transfer the baked avocado and sweet potato to a bowl. Add salt, mozzarella cheese, green pepper, and mash them. Spread the mash on a slice of bread and cover it with another slice to make a sandwich. Heat vegetable oil in a cooking pan. Cook the bread on a medium flame till it becomes golden brown. Flip the bread to ensure both sides get cooked evenly. Cut the bread into smaller portions. Cool and serve the delicious lunch to the toddler. An excellent lunch item when you are on the go with a toddler. It is dry and not messy but still packs a lot of energy! Boil the rice for 20 minutes till it gets soggy. If there is excess water left in the cooking pot, drain it out. Boil the vegetables on a medium flame for 20-25 minutes. Heat vegetable oil in a pan. Add garlic paste, vegetables, and salt. Shallow fry on a low flame for 5-10 minutes, while stirring to mix the vegetables well. Take the cooked rice in your hand, add the fried vegetables, and gently roll into a ball. Use more rice if needed to make the ball firm. Make as many rice balls you can with the vegetables and lunch for your toddler is ready. You can make noodles the healthy way right at home, with the addition of some vegetables. Cook the noodles by boiling them till they are soft. Boil the soya chunks separately for 5 minutes on a medium flame. Strain and soak them in cool water for 5 minutes. Squeeze the water later and transfer them to another vessel. Boil the vegetables for 20-25 minutes. Save the broth. Mix the noodles, cooked vegetables, soya chunks, and salt in a large bowl. Use the vegetable broth to soften the noodles if needed. A healthy green mash made with cottage cheese for added protein and calcium. Boil peas for 25 minutes or until completely tender. Heat vegetable oil in a pan. Add the cottage cheese and shallow fry on a low flame for 10 minutes, while stirring the cottage cheese. Put the avocado pulp in a large bowl, add the boiled peas and the cottage cheese. Mash and mix them well together before serving. Your toddler will love this delicious vegetarian lunch idea. Don’t be surprised if he takes an extra helping! Put the green pepper and salt in a bowl. Mix them well together. Spread a thin layer of cheese on top of the pizza base. Add the finely chopped green pepper on top of it. Top it with a thick layer of cheese. Preheat the oven to 450 ºF (232 ºC). Bake the pizza for 10 minutes, or until the cheese forms a light brown crust on top. Cut the pizza into smaller pieces and let it cool before serving it to the toddler. This is a simple lunch idea that is quick to prepare and also doubles as finger food. Cut the beans to finger-sized pieces and put them in a cooking pot with water. Boil the beans on medium flame and cook the beans for 15 minutes. Heat oil in a pan and scramble the egg. Put the cooked beans, scrambled egg, and salt in a large bowl to mix them all before serving. Momo is a dumpling filled with either vegetables or meat. In this recipe, you make some tasty chicken momos for your toddler’s lunch. Boil the minced chicken for 20-25 minutes or until completely tender. Strain the chicken and put it in a large bowl. Add garlic powder, salt, and mix them. Mix the rice and wheat flour, add water, and knead them to make a dough. Roll the dough and cut it out into small sections. Place some chicken in each section and roll it into a momo. Place the momo on a steaming grill or basket inside a cooking vessel that is half filled with water. Cover the lid of the cooking vessel, leaving a small opening for the steam to pass. Steam the momos on a medium flame for six minutes. 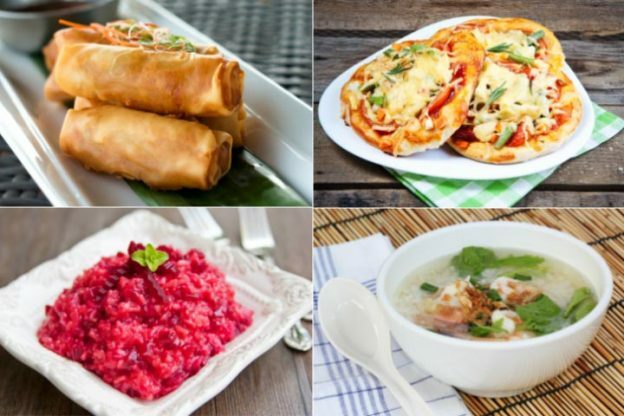 Cool the momos and serve the delicious lunch to your toddler. A combination of potato and thick milk cream makes a hearty lunch soup for a toddler. Boil the potatoes for 20 minutes on medium flame, until they are tender. You can also pressure cook the potatoes for six minutes. Strain the potatoes and transfer them to a blender. Add cream, black pepper, and salt. Blend them all. If the puree feels thick, add some cow’s milk to thin the puree. This dish is packed with micronutrients from meat and carbohydrates from breadcrumbs thus making it a balanced lunch meal for a toddler. Put all the ingredients in a large bowl and mix them thoroughly. Pour the mixture into a baking tray greased with a small amount of vegetable oil. Preheat the oven to 350 °F (175 °C) and bake for one hour. Once ready, cut it into smaller pieces before serving it to the toddler. A delicious onion and carrot soup with a touch of sweetness from apple. Boil the apples for 20 minutes and the carrots and onions separately for 20-25 minutes. Strain the apples and onions. Transfer them to a blender. Add cream, salt, and a cup of water. Blend them all. If the mixture seems too thick, add some cow’s milk to thin the consistency. These recipes will sure make your toddler love their lunchtime. 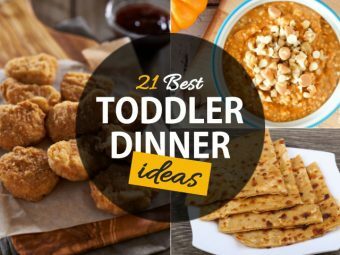 Follow a few tips, and you don’t have to worry about your toddler refusing to have their lunch. 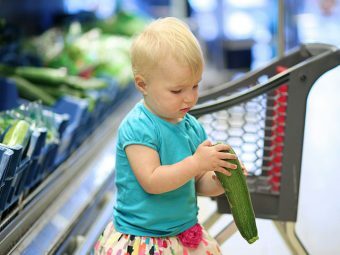 Let the toddler choose: You can try multiple preparations and let the toddler choose. 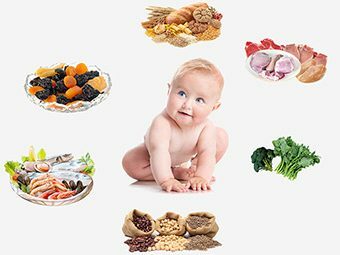 It can help the little one develop an interest in eating. Force-feeding or punishment for not eating is a bad idea as the toddler may associate negative emotions with food. Experts recommend giving the child some freedom to choose what they want to eat (1). 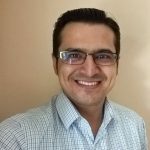 Rotate recipes: Try different recipes without repeating them on consecutive days. This also ensures that the toddler gets a balanced diet. Set a routine: Serve lunch at the same time every afternoon. It lets the toddler feel hungry at the same time every day thus improving their chances of eating properly, without throwing a tantrum. It is good to have lunch with family: Pediatric experts state that having meals with family helps boost the social and emotional health of the toddler later in life, while also minimizing the chances of eating disorders (2). 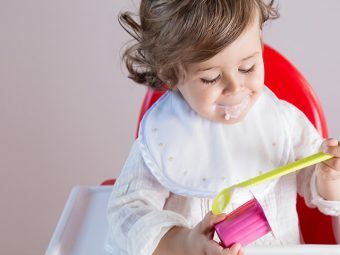 Eating a meal with other family members also gives an opportunity for social bonding, thus indirectly boosting the toddler’s interest in food. Lunch provides the calories that the toddler needs to stay energetic from afternoon to evening. You can make lunch a vital source of nutrition by choosing recipes with healthy ingredients. Try these recipes today and if you find that your child likes a specific variety of foods, try variations of that to ensure balanced nutrition. What is your child’s favorite lunch recipe? Tell us about it in the comments section.